The RP Photonics Buyer's Guide contains 1 supplier for phosphate glasses. A short fiber laser resonator implies a large free spectral range, making it easier to achieve single-frequency operation. A distributed feedback laser is inherently rather short, and a highly doped phosphate fiber then allows for more efficient pump absorption. 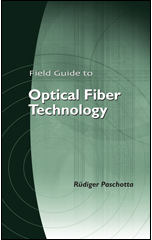 A fiber amplifier for ultrashort pulses is less prone to nonlinear effects if it is made from a short fiber. The spectral range with high optical transmission is about 0.4 μm to 2 μm – narrower than for silica glasses. The transition cross sections and upper-state lifetimes of rare earth ions in phosphate glasses are often favorable. For example, they are often well suited for making fiber amplifiers with large gain bandwidth, as the spectral shape of the transition cross sections is wide and quite smooth. Phosphate glasses have a very low glass transition temperature, typically below 400 °C. Therefore, phosphate fiber ends melt relatively easily when being heated in high-power operation. Special care is therefore required for pump injection when realizing high-power fiber lasers and amplifiers with phosphate glasses. Phosphate glasses exhibit a much lower optical damage threshold and a lower thermal conductivity than silica glasses. The opto-thermal coefficient dn / dT is negative, in contrast to many other gain media. This means that the direct thermal contribution on thermal lensing is negative (defocusing), whereas additional stress and bulging effects are positive (focusing); overall, thermal lensing can be rather weak. The nonlinear index of phosphate glasses is very low – nearly 3 times lower than for silica glasses. Mixtures of phosphate and fluoride glass are called fluorophosphate glasses. Similarly, there are phosphosilicate and aluminophosphate glasses. Such glasses are also often used as laser gain media. The combination of phosphate and silica fibers in a device can be problematic, since fusion splicing of these different materials is difficult (although not impossible) due to the very different glass transition temperatures.